WARNING: I am sharing my failure with the hopes that some of you will share how you overcome the challenge I faced. I am inspired by the many postings at Funky Junk Interiors SNS#55. 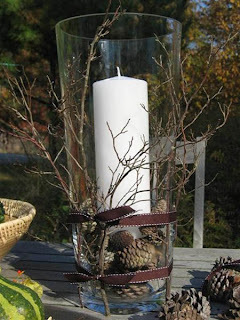 I have not done much decorating with natural elements - twigs, pine cones etc.. Well, I have used Pine Cones when I was a condo owner but I purchased them from a Christmas Store, they were cinnamon scented so they were a nice Christmas addition. Diversion ... I am typing this from their sofa now while one of their dogs tries to get my attention scratching on the patio door, there he's back in now, now dog #2 is scratching, Dog #2 is in and she is staring me down and wants my spot on the sofa, Alrighty now we're settled, me and 2 Golden Retrievers on a sofa and my toes are being licked, I can't concentrate, should I go get some socks? I got to this point and I was straightening the twine and a couple of little spiders started to surface, then a little worm eeeccckkkk! I quickly picked it up and ran outside with it and gave up! Can you see the bundle of candles on the left side of this image, I was going to use them since I wanted white candles, Frank pointed out that they looked like a bundle of dynamite, at this point I wish it was dynamite cus I would blow this DIY up! Why am I posting this? I'm new to "crafting off the land" please share with me ... is there something I should be spraying these items with before I use them so I will not encounter invaders? Okay, that was so darn funny! Sorry, I'm laughing with you, not at you. You were laughing weren't you? Ha! I might give it a spray with something to make sure. Or hose them down really well and let them dry out. I have this huge pine cone that I haven't brought inside yet, I just know there is something hiding it it. I may spray that guy down. I think the primary difference between your inspiration picture and the vase that you created was that the twigs were smaller than the vase in your inspiration picture. Now regarding the spiders, when you bring in pinecones, you actually have to "bake them" on a foil covered cookie sheet on low until all the sap starts to ooze out...probably at about 250 for 20 - 30 minutes. Just keep an eye on it. Then remove from oven and let them sit on the foil until cool. When you remove them from the foil, they might still have a few sticky spots, but they are beautifully as it looks like they have been stained. They are rich in color and texture and will really last nicely without getting your fingers all sappy. I tried this last year and was thrilled. Having said that -- this year I will just go to the dollar store and buy some -- so much easier! Thanks so much Anita and Jan! All the pine cones we have are huge! I found a lady online that dips them in scented wax and sells them for a $1 a piece ... I'd make a fortune if I did that! After this week I figured the firepit would be a nice place for them. So glad you posted this Jo, thanks to Jan, I will be baking my pinecones from now on! Didn't know that. I don't think it looks like dynamite(but that sure was funny!) I think it looks great, but Jan's suggestions are great too. That is wonderful that you shared your oops, I had one of those that was so pathetic, but so darn funny, so I understand. You still rock! We've finally started the painting!